When planning our quick San Francisco getaway, my husband and I realized that we would need to do a little pre-planning since we were to be in San Francisco on New Year’s Day, which meant that a lot of the usual places might be closed or booked, and then on a Friday night. Of course, in a city like San Francisco, you can’t just expect to waltz into a restaurant on a Friday night and not expect to wait an hour or so for a table, unless you have a reservation in advance. So, my husband had to come up with a plan for a restaurant for our last night in San Francisco. When I was looking at a map of the area surrounding our hotel, I threw out a couple of suggestions for my husband, but none of them really appealed to both of us. All of a sudden, I noticed the name of a restaurant that was located a block from our hotel. I recognized the name because I knew that a branch of this London-based restaurant, lounge and nightclub chain opened a few years ago to much fanfare and celebrity patronage here in Beverly Hills. What I didn’t know was that they had a location in San Francisco. After checking the website and the menu, my husband decided that we should give the San Francisco branch a try and see what it was that everyone was raving about. The Michelin-starred restaurant, lounge and nightclub brand known as Hakkasan was started in London in 2001. Under the direction of Executive Head Chef Tong Chee Hwee and expansion under the guidance of Michelin-starred International Executive Chef Ho Chee Boon, Hakkansan’s menu reflects contemporary Chinese cuisine which combines traditional Chinese techniques with fresh local ingredients which combine together to bring forth classic Cantonese creations. From that first location in London, Hakkasan has expanded to include locations in Las Vegas, Mumbai, Abu Dhabi, Doha, New York, Miami, Shanghai and San Francisco among others. The San Francisco opened in November of 2012 in the iconic One Kearny building in the heart of the Financial District of San Francisco, only a few short blocks from Union Square. With interior design originally created by a renowned interior decorator, the design of the restaurants reflects their philosophy of vibrant, intriguing and inviting. Anchored by a unique V-shaped bar as the restaurant’s centerpiece, the restaurant is stunning with intimate blue lighting, modern Chinese decorations and contemporary hand-blown glass pendant lighting, Hakkasan San Francisco is indeed intriguing and inviting. To celebrate the New Year, my husband and I decided we’d go all out and get the full Hakkasan experience. That starts with some drinks to toast with. After looking over the cocktail menu, I was pleased to see that they actually offered a variety of non-alcoholic creations. I ended up ordering the Virgin Hakka. Made with lychee juice, coconut cream, lime juice and passion fruit and finished off with an actual lychee fruit, this drink was fantastic. In fact, it may be the best non-alcoholic drink I’ve ever tasted. It was definitely refreshing, and a little sweet, but also a little tangy and 100% fruity. The sweetness came from the lychee juice and the tanginess came from the passion fruit. With a little twist of lime juice to add a bit of citrus flavor and the creaminess and smoothness of the coconut cream to add some complex flavor, this drink felt fizzy, even though it wasn’t, and was completely thirst-quenching. I seriously considered ordering another round of the Virgin Hakka, which is something I’ve never done with any other drink. It really was fantastic. My husband had to agree on superb quality of the drinks that were being served by the bar. Ever since enjoying an Old Fashioned at the Portland City Grill, he’s obviously decided that this is his new go-to drink. As soon as my husband saw the Rum Old Fashioned on the cocktail menu, he knew he had order one. 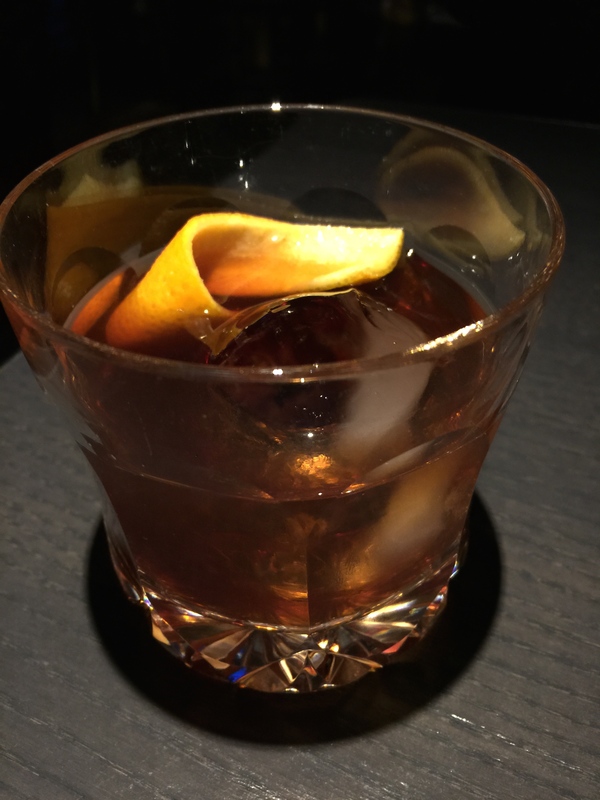 At Hakkasan, their Rum Old Fashioned is made with Ron Zacapa 23 yr, Graham’s 20 yr Tawny port syrup, orange peel and Angostura bitters. One sip of his drink and my husband was awed by how good it was. With the addition of the orange peel into the drink along with a cherry, he could really taste the orange flavor, which he really liked. The drink was made with good, high-quality liquor which my husband said was quite tasty. 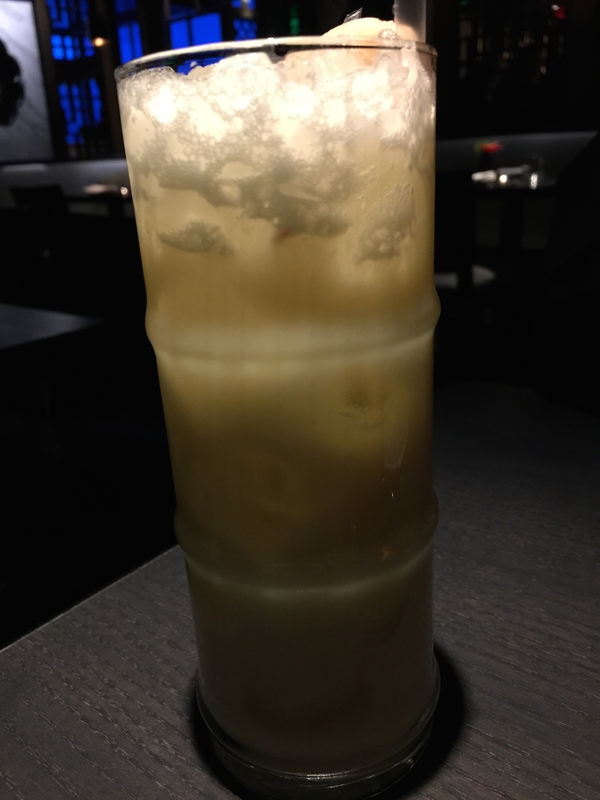 My husband also enjoyed the fact that Hakkasan didn’t skimp on the amount of liquor used in the drink, so not only was the drink made with high-quality liquor, there was quite a bit of it too, so it wasn’t watered down or diluted. My husband has had a lot of drinks in his life, and he definitely ranks the Rum Old Fashioned as one of the best mixed drinks he’s ever had. This was a promising start and a peek into what was to come for the rest of our meal. We decided to start off our meal with two different appetizers. 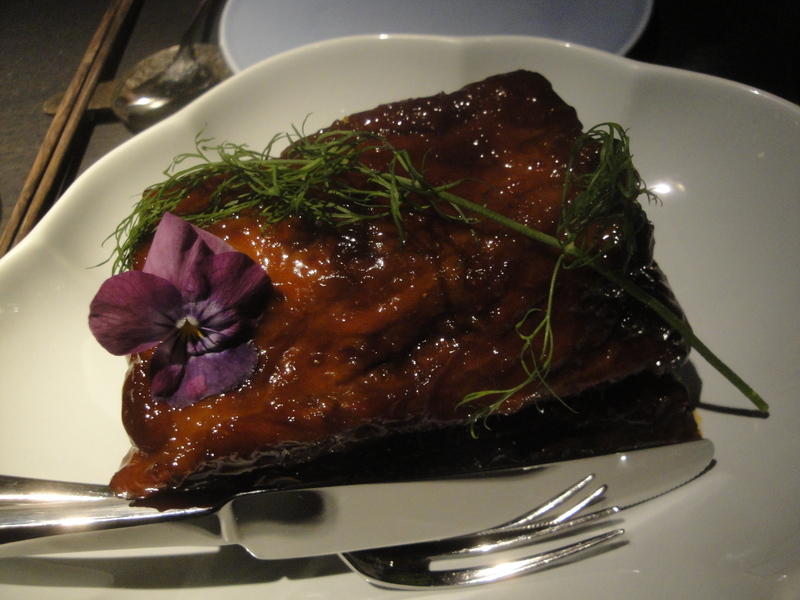 The first was the jasmine tea smoked pork spare ribs. The dish consisted of 2 large pork spare ribs which had some sort of sweet, sticky glaze on them. The ribs were smoked to the point of being fall off the bone tender. As you can see, they only provided a butter knife to us, but even that wasn’t necessary as all the meat just feel right off the bone with the use of a fork. One bite and the first thing I could taste was the jasmine tea smoke. The ribs had a sweet flavor with the essence of tea-flavored smoke lingering over the entire dish. For this much subtle tea flavor to infuse into the smoking process, the ribs must have been smoked low and slow for a long time. The meat was so tender and flavorful. This was a much larger appetizer than I had expected and really was large enough to be an entrée rather than just an appetizer. As we were at a famous Chinese restaurant, my husband really wanted to try the Hakka steamed dim sum platter which came with a little bit of everything and was perfect for 2 people to share. 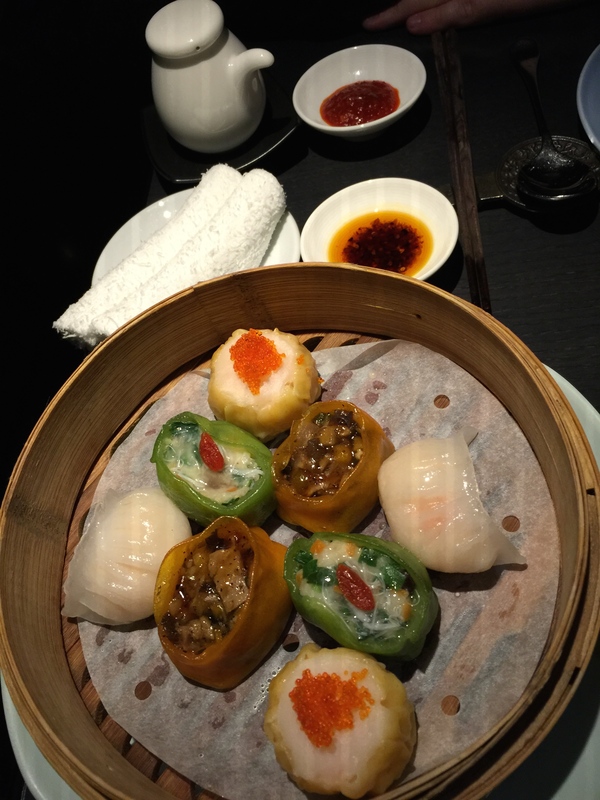 The dim sum platter, served in a traditional bamboo steamer consisted of 2 pieces of 4 different types of dim sum to provide just a little bit of a hint, a sample really, of the dim sum Hakkasan offered. The different dim sum dumplings consisted of scallop shumai with tobiko egg caviar, har gow, Chinese chive dumpling and black pepper duck dumpling served along side some soy sauce and two different kinds of chili oil dipping sauces. Har gow has always been my favorite dim sum dish and the one I always ask for when I go out for dim sum. Commonly thought to be the quintessential dim sum dish, this shrimp dumpling is so supposed to be a one-bite wonder consisting of shrimp inside a thin, translucent wrapper that traditionally is pleated 7 or more times. This har gow was tasty, with perfectly cooked shrimp and a well steamed wrapper that wasn’t too sticky and too thick, as it can sometimes be. The scallop shumai with the tobiko egg caviar was sweet and flavorful and well prepared. It may have been my favorite of the 4 different types of dumplings we were served. The Chinese chive dumpling, which was vegetarian, was my least favorite of the dumplings with a creamy, liquidy texture that I didn’t love. The black pepper duck dumpling was good, stuffed with duck meat, which my husband loved. However, the black pepper flavor was so strong in the dumpling that it really gave the dumpling some spice and heat to it, and mind you I love black pepper and I was still reaching for my drink to defuse some of the spice in the pepper. To enjoy with our entree selections for the evening, we ordered the egg and scallion fried rice. After all, I am Asian and we tend to have rice with every meal. The egg and scallion fried rice sounded so good, and yet so simple. My husband isn’t the biggest fan of steamed white rice, so this was our compromise to order a simple fried rice. 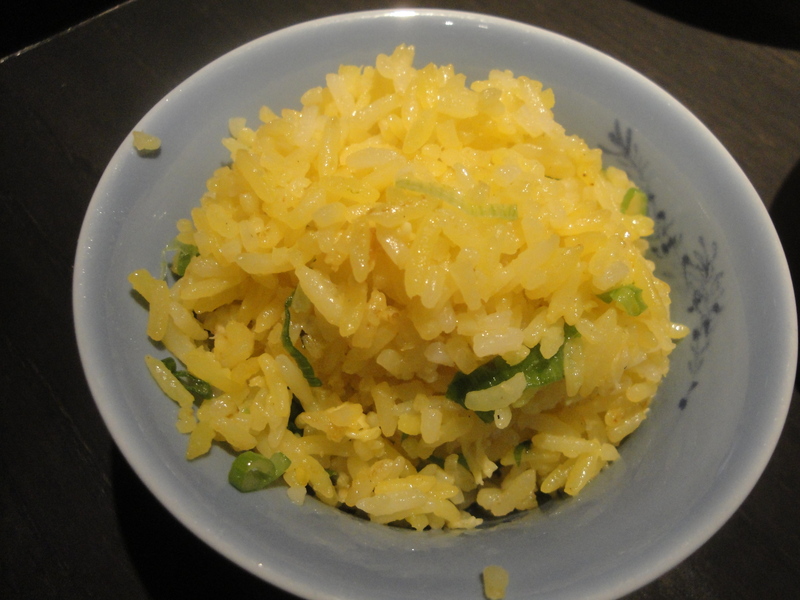 The yellow color of the rice comes from the egg and it’s lightly flavored with nothing more than some sliced scallions for a slight onion flavor. I like that with just two simple ingredients, Hakkasan created a delightful, and light, fried rice without the need of adding all sorts of additives I see often in fried rice at Asian restaurants – diced bell peppers, peas, carrots, etc. – all of which are unnecessary to create something that is pleasing. While my husband was eyeing the Peking duck, we knew that would be too much duck for just the two of us to enjoy. Our waitress had indicated that the Peking duck would be appropriate for about 4 guests to share. Instead, we chose the Pipa duck. 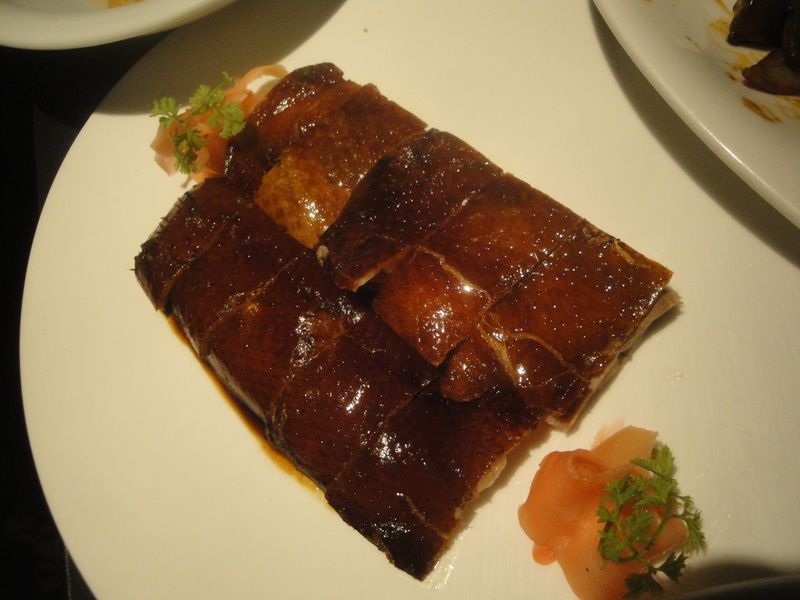 Pipa duck is duck meat with crispy skin, topped with homemade hoisin sauce and pickled ginger. This was actually the perfect size entree for my husband and I to share. The duck was fantastic. I’m not the world’s biggest fan of duck, but I thought this duck was out of this world. The skin of the duck was crispy and oily and exactly what you look for when you serve duck with its crispy skin. The duck meat was tender and incredibly flavorful. The homemade hoisin sauce that was served alongside the Pipa duck was fantastic, slightly sweet and a great compliment to cut through the fatty duck meat. This was definitely one of the best duck dishes I’ve ever enjoyed and my husband thought the same. For a beef entree, I chose the stir-fry black pepper beef ribeye with merlot. After having had the very peppery black pepper dumpling in the dim sum sampler, I was hoping that I hadn’t made a mistake in ordering the black pepper beef dish. It turns out, I didn’t make a bad decision as the black pepper stir fried with the beef ribeye, merlot, roasted garlic and onions was incredible. The black pepper added to the flavor of the beef, but wasn’t so overpowering to give it too much heat. The roasted garlic cloves was a nice touch as it added a bit of sweetness to counterbalance the pungent garlic flavor. And of course, onions and beef go well together in a stir fry. The beef ribeye was incredibly tender and flavorful. 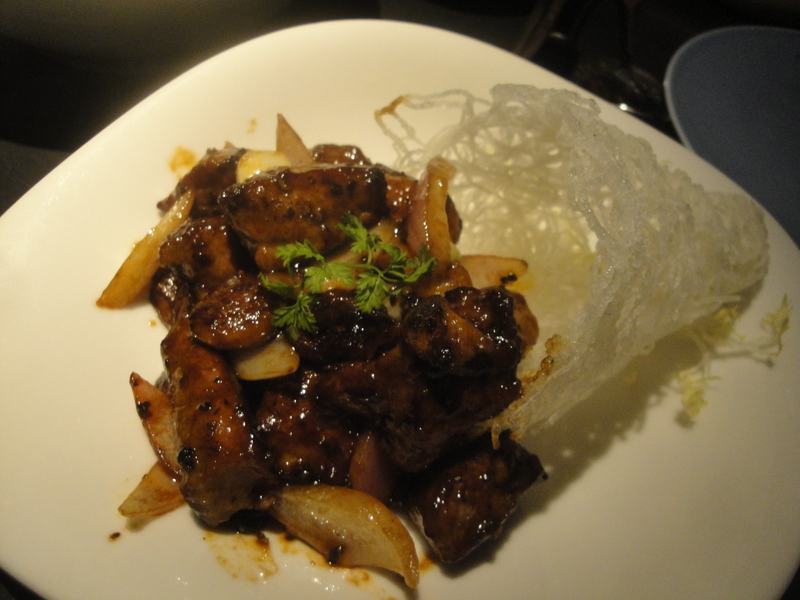 This is exactly the type of dish I had in mind when I ordered it, so Hakkasan didn’t disappoint. Since we ordered a duck dish and a beef dish, we figured we should order a seafood dish. The dish my husband chose was the roasted silver cod with champagne and Chinese honey sauce. I was a bit concerned about the champagne, but my husband told me not to worry about it since it would be like cooking with wine sauce, all the alcohol gets burned off. I noticed that every other table sitting around us also ordered the roasted silver cod, so it must have been quite the popular dish. The fish filet was much larger than I had anticipated it being, and it looked so delectable. A nice golden brown roast on the filet and full of white, flaky meat. 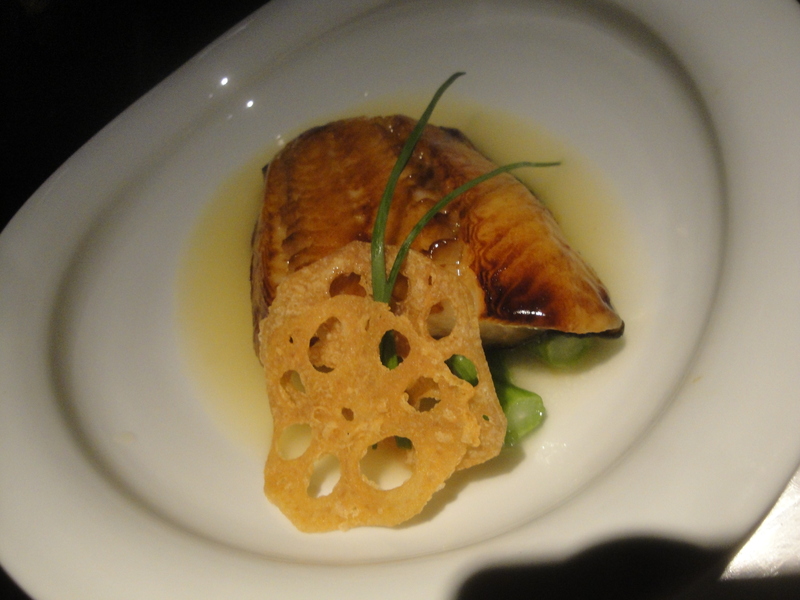 The fish itself was perfectly cooked, flaky, delicious and tender. 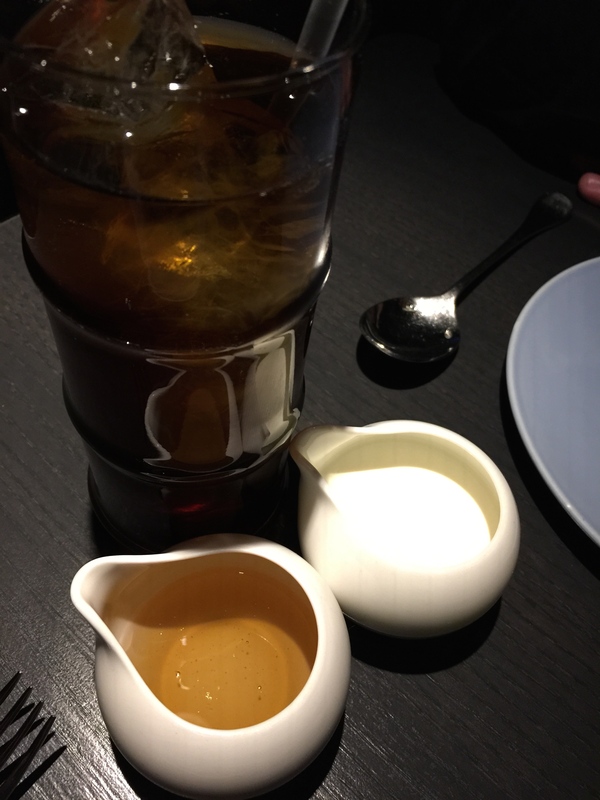 However, the champagne and Chinese honey sauce was just a bit too much for me. The champagne flavor was clear as day in the sauce that covered the entire fish filet that after awhile, I couldn’t take it anymore. My husband thought that the fish and the champagne sauce were fantastic, so I let him finish off the dish. This has nothing to do with the restaurant as they delivered exactly what they advertised, it’s more my personal preference for not enjoy the champagne flavor of the sauce. But if any of the other tables around us were any indication, this roasted silver cod dish was off the charts. Normally, I’m not the biggest fan of ordering after dinner drinks, but one drink I have a hard time resisting is iced coffee. So as soon as I saw iced coffee on the after dinner drinks menu, I had to order it. I’ve never had iced coffee delivered to me in this particular way before, and it made me wonder why iced coffee isn’t served like this more often. I was given a cup of ice brewed coffee and then 2 small saucers to go with one, one with creamer and one with liquid sugar. I love the idea that they provided the sweetener in the form of liquid sugar instead of sugar packets or some other form of sweetener. I’ve never seen liquid sugar before with iced coffee, and to me, it just makes sense. In this way, you can control what goes into your iced coffee and you can adjust it to your tastes. For dessert, my husband ordered the kalamansi chocolate ganache. Neither my husband nor I knew what kalamansi was, but the description of the dessert itself sounded so interesting, my husband wanted to give it a try. 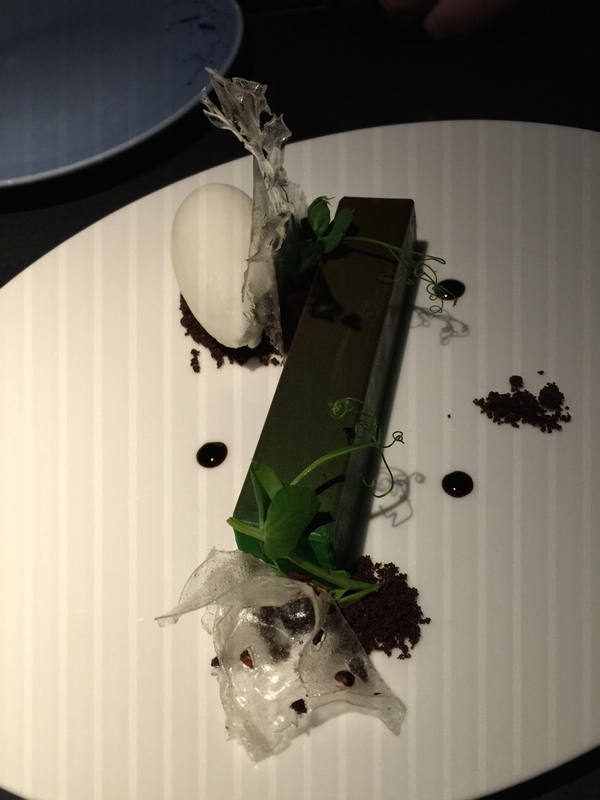 According to the menu, the dessert was served with a eucalyptus sorbet and cocoa nibs. I think it was the eucalyptus sorbet that really caught my husband’s attention. It turns out that kalamansi is a hybrid ornamental fruit tree that is a mix of a mandarin orange and a kumquat. First off, the presentation of the dessert was amazing. Beautifully pulled sugar was decoration on a plate with a chocolate ganache rectangular, candy-bar shaped dessert with a light green and dark chocolate tint. Sitting on a bed of coca nibs was a canal of eucalyptus sorbet. The desert looked like a true pice of art. My husband thought that the ganache was fantastic, a bit tangy and sweet at the same time, but not too bitter. The tangy flavor comes from the kalamansi mixed into the chocolate ganache. The blown sugar decoration added some sweetness, but also was a beautiful accompaniment to the dessert. And the eucalyptus sorbet was fantastic, the taste was great, but subtle and really paired well with the cocoa nibs and the more decadent chocolate ganache. The dessert was not only beautiful to look at, but was delicious to devour as well. I chose the banana pearl pudding with green tea matcha chiffon, caramelized pecans and smoked caramel ice cream for my dessert. I had no idea what in the world green tea matcha chiffon was, or how smoked caramel ice cream would taste, but I didn’t care as all I saw was banana pearl pudding. While I thought my husband’s dessert was a work of art, my dessert was truly the most unique dessert I’ve ever seen. 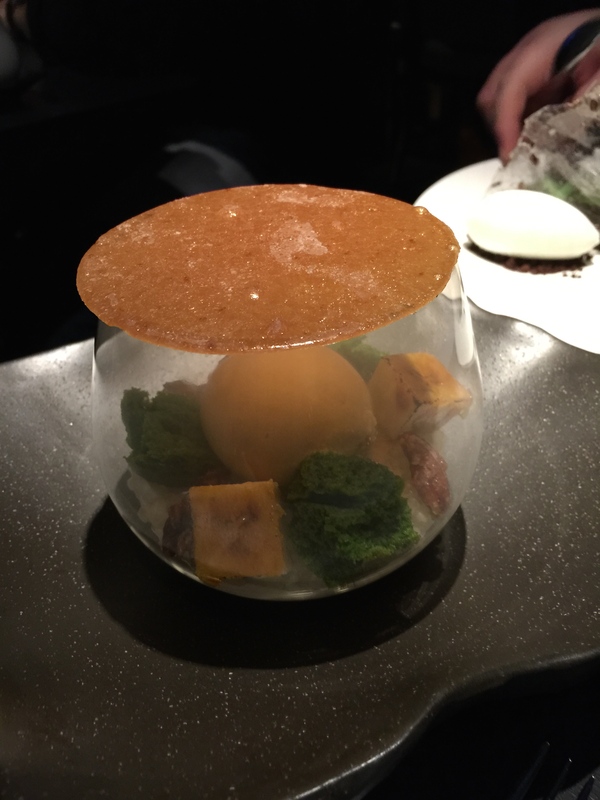 Served in a small glass bowl which contained caramelized pecans, a canal of caramel ice cream sitting atop a bed of pearl pudding and surrounded by what looked like small miniature green bushes – which was the green tea matcha chiffon – and caramelized banana slices, the entire bowl as topped with a caramelized sugar crust which sealed the top of the glass bowl. The way it was explained to me is that smoke is pumped into the glass bowl before it is sealed with this caramelized torched sugar crust which seals the smoke inside. The idea is to use a spoon to crack the sugar crust. The longer you let the smoke settle in the glass bowl without breaking the crust, the more the smoke flavor will be imparted onto the items inside the glass bowl. I told my husband to do the honors and use the spoon to crack open the sugar crust on the glass bowl. Once the sugar crust was broken, you could literally see, and smell, the smoke wafting up and out of the glass bowl. It was the neatest thing I’ve ever seen with dessert before. I was so excited to give this dessert a try, if it tasted half as good as its unique presentation, I was going to love this dish. First off, you could definitely taste the hickory smoke on everything inside the glass bowl. The caramel ice cream had a nice smoky flavor which really worked well. The pearl pudding on the bottom of the bowl had such good flavor and worked really well with the smoky, caramelized banana. The green tea matcha chiffon was different and unique. It was more like fluffy chunks of green tea sponge cake that had such subtle flavoring to them. And then the caramelized pecans were a great unexpected bonus adding a unique texture and crunch to the dessert. 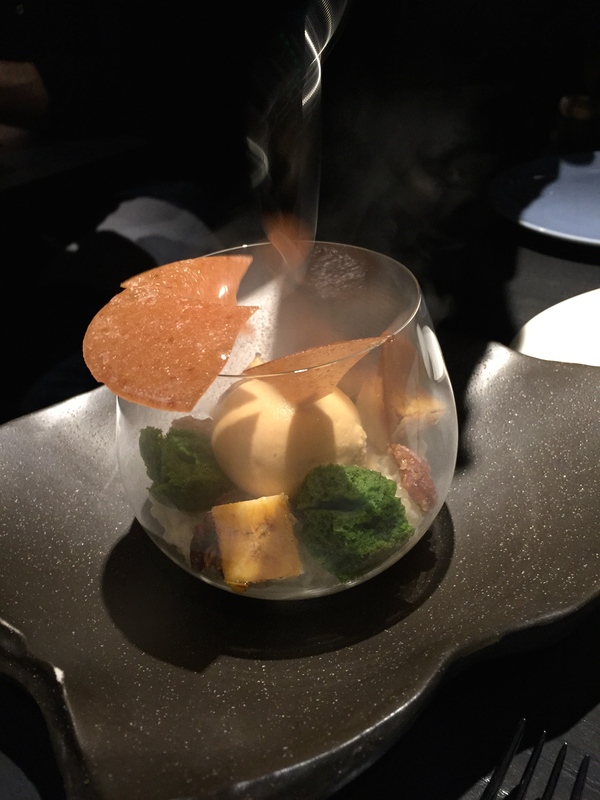 This was truly the most unique dessert I’ve ever seen with a taste that was so unique and different, but yet delicious and fit with the modern Asian flavors that Hakkasan is known for. 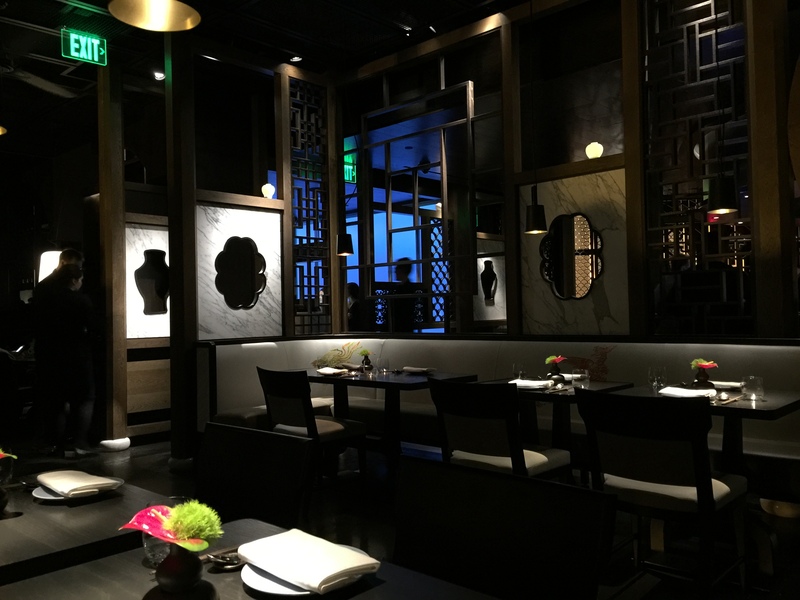 Dining at Hakkasan San Francisco was our little Happy New Year treat to ourselves. A nice, extravagant way for us to celebrate the last great year and look forward to all the amazing things to come in this new year. And the reputation of the restaurant definitely lived up to its hype. The atmosphere was fantastic, intimate, private and inviting, the service was superb, and the food was delectable. 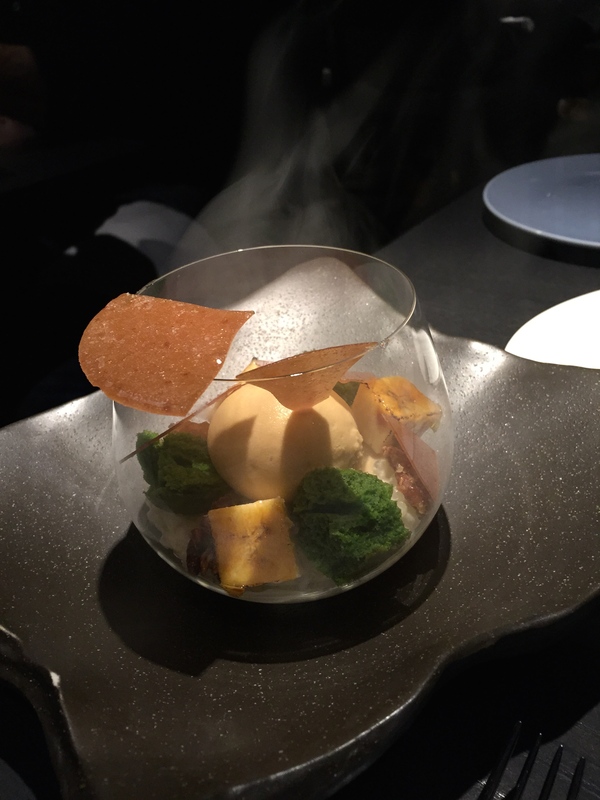 My husband and I weren’t quite sure what to expect when we made a reservation to dine at Hakkasan, but whatever we were expecting was blown out of the water by what we actually experienced. It’s always a treat when such a well-known restaurant exceeds even the expectations you have for it. The dishes were inventive, creative, but yet with a familiar Asian flair. And I’ve never been so impressed with desserts in my life. 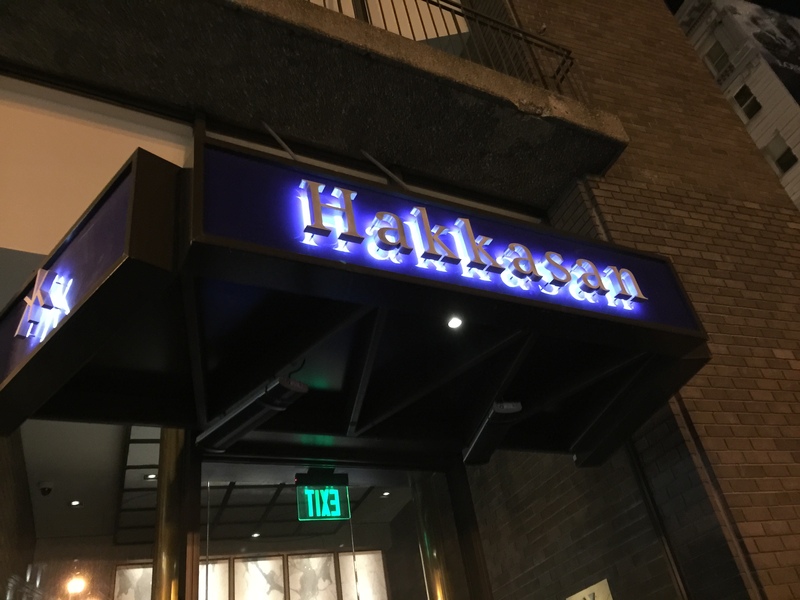 If you’re looking for a nice, elegant dining experience in the heart of the Financial District of San Francisco, Hakkasan would easily make the top of my list. Your husband has had a lot of drinks in his life?? I’m not even going to touch this one… 🙂 But since he read the blog post and didn’t have any comments on this section, I’m sure he doesn’t mind that I described him this way…. lol, I think you described it nicely.